Cook bacon until crisp, remove from skillet, drain and chop. Cook broccoli in bacon grease for 5-10 minutes until tender - do not overcook. 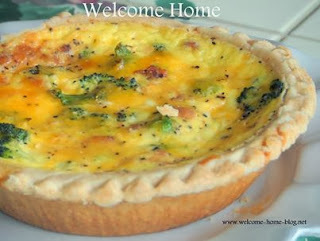 Spread cooked broccoli and bacon in crust. Whisk milk, cream and eggs together, and pour over broccoli and cheese. Bake 25-to-30 minutes (you can no longer see liquid but center jiggles slightly when moved). Place flour, salt, butter and shortening in large bowl. Rub together until broken into pieces the size of oatmeal flakes. Do not over-blend. Using pastry cutter or two knives, add ice water, a little at a time, mixing until it just starts to hold together. Press dough into a ball. Knead briefly into fairly smooth ball. Sprinkle lightly with flour and wrap in waxed paper. Chill 1-to-2 hours in refrigerator. When ready to roll, sprinkle work surface and rolling pin with flour. Roll pastry out into a circle 1/8 inch to 1/4 inch thick. Place crust in pan and press gently to line inside. Bake at 400 degrees (preheated) for about 10 minutes.